I've been parenting hard due to the holidays, so all I have today is this 6th-century terracotta (haniwa) monkey. As the description says, it's been worn down to a torso and a head, but the slightly twisted pose is probably because a baby monkey used to be attached to that lighter patch on its back. The only other haniwa monkey I know of is this one (attached to a cylindrical container about 50 cm tall), excavated in Maebashi, Gunma, which is indeed accompanied by its child. I just noticed that Tinker Tailor Soldier Spy (the unforgivably disencommaed movie adaption of Tinker, Tailor, Soldier, Spy has the Japanese title Uragiri no sākasu 裏切りのサーカス, "Circus of betrayal". The original novel has always been simply Tinkā, teirā, sorujā, supai , so this represents a change in expected audience, naming conventions, or both. My money's on the former, based on the hypothesis that Japanese people reading books by John le Carre are doing so at least partly out of Anglophilia, and thus welcome exposure to English nursery rhymes they wouldn't otherwise know, while the movie promoters are afraid that leaving the first half of the title completely opaque (even English-speaking people barely remember what a tinker is) will discourage potential viewers. Sidebar: The Spy Who Came in from the Cold is translated Samui kuni kara kaette kita supai 寒い国から帰ってきたスパイ, "The spy who came back from a cold country." This is a bit unfortunate in a couple of ways. First, the fact that you can't use adjectives as substantives in (contemporary) Japanese means that the delightful ambiguity of "the cold" has to become "a cold country" (I suppose samusa could have been used, but combining that with kaeru that feels unidiomatic to me — "the spy who came in from the coldness"). Second, and related, the Japanese calque for "cold war" was 冷戦 — different character for "cold." I'm sure most readers figured it out, but the upshot is that no way was found to recreate the original title's balance of simplicity and depth. Completely unrelated and extremely nerdy: An interesting (if unfortunately unfriendly on one side) exchange took place on japanese.stackexchange.com yesterday. To summarize, the publisher Shōgakukan prefers to render its name, in both kana and Roman characters, as shown at left — that is, in a way that preserves the etymology: shōgaku 小学 "elementary school[ing]" + kan 館 "house" (they started out publishing materials for elementary school-age kids). But the name is actually pronounced shōgakkan, same way that gaku 学 + kō 校 = gakkō 学校, "school." So we see citations like this on WorldCat: the Shogakukan progressive English-Japanese dictionary , published by "Shōgakkan." On the other hand, it's not hard to find another entry for the book on WorldCat which gives "Shogakukan" as the publisher, and we can also find the Shogakukan Random House English-Japanese dictionary, published by "Shogakukan" (note no macron either!) but attributed to "Shōgakkan," along with Random House. So clearly WorldCat entries are not going to prove anything. It seems to me that this is basically a style guide issue: do you romanize a publisher's name (as opposed to a book's title, or a personal name) strictly according to pronunciation, or do you use their preferred spelling? I had a quick look in the MLA Style Manual and couldn't find anything on this issue specifically, although we are advised to "follow known preferences" when romanizing Chinese and Japanese personal names. Do other commonly-used style guides prescribe more specific rules for "Shogakukan/Shōgakukan/Shōgakkan" situations? Ubatamari, ware o, ware o kou rasi, kosakagoe naru ya, goe naru ya. Oh! where the matrons gather, yes! The gathered matrons want me, want me, so it seems, with their strong sake voices, oh! their voices! Kimura Noriko, editor of the book I found this in, notes that we have no other contemporaneous attestations of the word uba in this sense, but it seems fair enough to assume that it means "old woman" (for historically appropriate values of "old", of course), same as it did in later times. What I have translated "strong sake voices" is in the original a compound word: kosakagoe, from ko- ("strong, rich") + saka- ("bound form" of sake) + rendaku'd koe ("voice"). It's interesting that "voice" appears in rendaku'd form as goeon the next line too, even though there the kosaka- part isn't repeated. Well, it's interesting to me. Kimura Noriko 木村紀子, trans. and ed. Saibara 催馬楽. Tokyo: Heibonsha, 2006. Print. McCullough, Helen Craig, trans. and ed. Tales of Ise . Tokyo: University of Tokyo Press, 1968. Print. This week's reading is Prosodic Faithfulness and Correspondence: Evidence from a Japanese Argot , by Junko Itō, Yoshihisa Kitagawa, and Armin Mester. The "Japanese Argot" in question is called zūjago, which is itself an example of zūjago: the etymology is zūja "zūjago for 'jazz'" + go "language". menfu < fumen 譜面 "sheet music"
jaamane < maneejaa マネージャー "manager"
yanopi < piano ピアノ "piano"
rūbi < biiru ビール "beer"
gaikichi < kichigai 気違い "crazy"
patsura < rappa 喇叭 "trumpet"
kuribitsu < bikkuri びっくり "surprise"
a. Reversal: Argot words are reversals of their bases (in a sense to be made precise). b. Template: Argot words either have the form "F+F" ("foot+foot") or the form "F+L" ("foot + light syllable"), nothing else is admitted. c. Predictability: Within the limits of (a), the prosodic type of an argot word is determined by the prosodic form of its base. d. Preservation properties: The mapping relation between base and argot form allows for weight adjustments (mora deletion and mora insertion) and segmental spreading, but not for segment deletion or segment insertion. e. Null output: As a consequence of (b) and (d), words of Japanese beyond a certain size limit do not have a corresponding argot form. Rule (a) is pretty self-explanatory, although it's interesting to note how the segmentation works. For example, the gemination marker /Q/, written with (and in many cases etymologically equivalent to) a small tsu, gets reanalyzed as an actual tsu when ends up not followed by a consonant any more, e.g. bikkuri (bi-tsusmall-ku-ri) → kuribitsu (ku-ri-bi-tsu). The meaning of rule (b) is that a zūjago word must begin with a foot (either a "long syllable" or two light syllables [morae, basically]), and end with either another foot or a single mora. For example, if you start with sake ("alcohol[ic drink]"), you can't just flip it to kesa, because that gives you two light syllables and nothing else. Instead, you lengthen the first syllable to make it heavy: keesa, a well-formed zūjago word. Similarly, if you start with biiru, you can't just swap the existing parts around to rubii, because this gives you a light syllable followed by a foot (the heavy syllable bii). Instead, the ru gets lengthened into a heavy syllable, and the bii contracts to a light one (for other reasons): rūbi. A word that is originally just one short syllable, though, like hi ("fire", "light [for a cigarette]"), gets put through the wringer and ends up iihi. The authors see this as working as follows: the initial word hi is analyzed as two overlapping parts, /hi/ and /i/. This is then treated the same way as sake: the syllables are swapped giving ihi and then the new first syllable is lengthened to give iihi, the final zūjago form. The weakness in a paper like this is obviously going to be that there is no way to produce a rigorous, watertight set of rules for generating the lexicon of a demimonde argot. As an example, one page after the authors declare that original words of six morae or more cannot be zūjagofied (because they can't be processed into a form of two feet maximum), they offer bontoro as zūjago for toronbōn ("trombone"), which is... a six-mora word. However, they do recognize this as an issue; bontoro is, in their analysis (which I presume represents the "native speaker" judgment of Kitagawa), an "isolated and lexicalized" example, not producible by the "productive strategies" they identify. You just have to keep in mind that this paper is a description of a particular corner of a certain language game, rather than a Key to all Jam Session Banter. 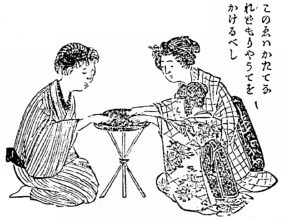 This has got to be the greatest example of ateji ever: kokkuri, the etymologically onomatopoeic name for a table-turning-style divination game hugely popular in the post-Meiji Restoration period, spelt "狐狗狸": "Kitsune, tengu, tanuki". this association of the kitsune, tengu, and tanuki transcends the name of the game and comes to be literally embedded in the practice. [Early kokkuri debunker Inoue] Enryō's informant from Miyagi Prefecture, for example, describes the construction of the apparatus: "Into the bamboo rods insert tags inscribed with the words kitsune, tengu, and tanuki" [...] And in Ibaraki Prefecture: "Trace the characters on the underside of a tray with the tip of your finger, and cover with a cloth" [...] The inscription of these three yōkai endows the otherwise mundane structure with a supernatural quality. Operating through the principles of sympathetic magic, the graphs serve as metonymic representations, their presence a sort of lightning rod to call down the spirits they signify. "This picture shows [each person using] one hand, but [in reality] both hands must be placed [on the apparatus]."